The The Journey Oracle is a vibrant, modern 46-card oracle deck created by Adrienne Trafford and published by Schiffer. "Why am I here and what have I done of worth? Find these answers as you explore emotions, fears, hopes and self-realizations with this 46-card oracle depicting beautiful and strong, decisive women representing everyday issues. Improve yourself, day-by-day, as you find answers to doubts in your heart or struggles along your path by allowing the oracle to help you see where you were, where you are now, and where you may be going. As you journey, you will find that though our paths may not look the same, we are all seeking the same truths. But your journey, throught these cards, will reflect your personal pathway to those truths. Whether the cards advise you to "Stand up, dig your heels in, and fight back" or that "Even on the dreariest day, the sun is still there behind the clouds", you will feel the pull of your heart strings as you warm to the beat of a journey meant only for you." The cards measure approximately 2 7/8 x 4 1/2". The finish is glossy and the card stock is sturdy yet flexible. The backs are not reversible, as I don't believe the cards are meant to be used with reversals. The backs feature a lovely image of a tree with a nest in it. The two blue eggs in the nest are also featured in several of the cards, a symbolic nod to the artist's two daughters. The borders of the cards are colorful and bright, with a thin inner border of black jagged line, which I really like. The titles of the cards are featured along the bottom border in an attractive font. A unique feature of this deck is that there are four horizontal cards. They don't appear to stand out more than any others as far as meanings go. But they do draw more attention in a reading, as they break up the monotony of the spread. There have been times when I only wanted to draw two cards, but the second card was horizontal, and it felt unfinished until I closed it up with a third, creating bookends to the horizontal card. This additional card supplied an answer to the question that the first two cards piqued. So while some may find the inconsistency distracting, I find the horizontal cards an interesting and delightful addition to the deck. I also really like that there are the four playing card Queens (Hearts, Clubs, Spades and Diamonds). 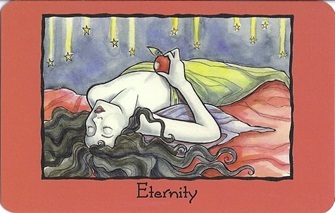 And I love the fairy tale references (Snow White in the Eternity card and Alice in the Confined card). There are even a couple steampunk themed cards, which I love. There are also archetypes such as Goddess, Vampire, Mermaid, Eve, Actress, Mother Earth, Ancestors. And then there are cards that are titled to portray a feeling or trait such as Independence, Loss, Resilience, Appreciation, Drifting, Passion, Hope, etc. There are only women featured in the cards... not a man in sight. So, for some, this may limit the deck's use to feminine readings. 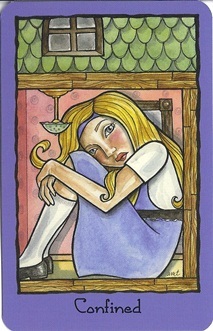 The women display an array of emotions in the cards: sassy, bold, confident, melancholy, pensive, distraught, playful, etc. I have found The Journey Oracle to read very thoughtfully. I normally pull three cards in a reading, but I intuitively felt that this deck should be read with pairs of two. So that's how I have used it, and the pairs have always been relevant to my day or specific inquiry. In the case where I felt drawn to pull a third card, it has proven to provide a helpful addition to the reading. The readings I have done with this deck have been truthful and helpful in a very gentle but strong way. The Little White Book that accompanies the deck is 96 pages, with a thick shiny colorful cover. There is a brief introduction written by Trafford, followed by the meanings for the cards. Each card is given a two-page spread. The left side displays the meaning of the card, while the right side features a black and white image of the card. The LWB wraps up with an "About the Artist/Author" page. There are no spreads in the book. The deck and book are housed in a box where the lid lifts and closes magnetically, which is something I've mentioned before as being a genius idea by Schiffer. It does not belong to you, but you will feel quite powerful with it in your hands. You are holding something dear. This is your talisman. Perhaps it is physical - your grandmother's blanket, a smooth pebble or shell from a favorite trip, an old letter, a lock of hair. It could be metaphoric: You hold the heart of your love, the memory of one who is gone. Hold it in your hands and at the front of your mind, and recall the person or place to which it is attached. They are with you today more than ever and have a message for you: No need to worry; they will protect you. I really love this deck. I love the modern, whimsical lines and bold colors. I love the beautiful women in it, and the many emotions they encompass. 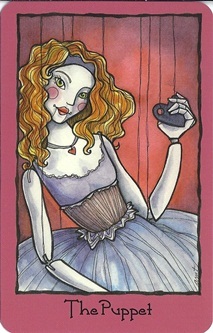 It's a great deck to bring out your inner femininity and strength, and to seek gentle compassion and empowered advice. It's most definitely a treasured addition to my arsenal of decks. See below for more images from The Journal Oracle. This deck review was originally published on my previous blog (Tarot Dame) on 10/10/11.